Perhaps you haven't seen the 2010 film Monsters directed by Gareth Edwards. You should. Utilizing a production budget that never even came close to sniffing seven digits, the cast and crew literally worked out of a single van, filming in locations without permission and asking actual citizens to participate as extras on the spot. It is a project crafted shockingly well out of sheer passion for their work, and it delivers its themes with a bit of subtlety and intelligence. Where as some movies resonate short term but fade when analyzed in the rear-view mirror, Monsters continues to linger long after the final frame. The chemistry between the two leads (play by Scoot McNairy and Whitney Able), the awe-inspiring visual design of the monsters, and the imagery of the setting and the majestic creatures that rise above it all work so well in the moment and remain impressive in hindsight. Unfortunately, I have very little positive to say about it's ill-advised sequel. Monsters: Dark Continent is the debut feature from director Tom Green and rather than build on what worked so well years ago with Edwards film, the material is instead regressed into an all too familiar and uninspired war picture. Ten years after the events from the original Monsters, the 'Infected Zone' that resided on the border of the United States and Mexico has now spread across the globe, including the Middle East which is already enduring the effects of military conflict. The story focuses on four buddies who left their homes and families behind to serve their country, and all of the tired cliches of modern military narratives are ever present and accounted for. The dialogue and performances are stilted, the barren and arid landscapes do little to make any of the photography or imagery stand out and that thematic subtlety and intelligence I admired so greatly from Edwards vision has been completely abandoned. A critical take on our ethical behavior fighting recent wars that asks the question, who really are the monsters after all? It's not that the themes aren't worth exploring, although one could argue we have been down that road far too many times already. It's that if you want an audience to dig the same hole even deeper they must be inspired to do so by something compelling and richly rewarding. 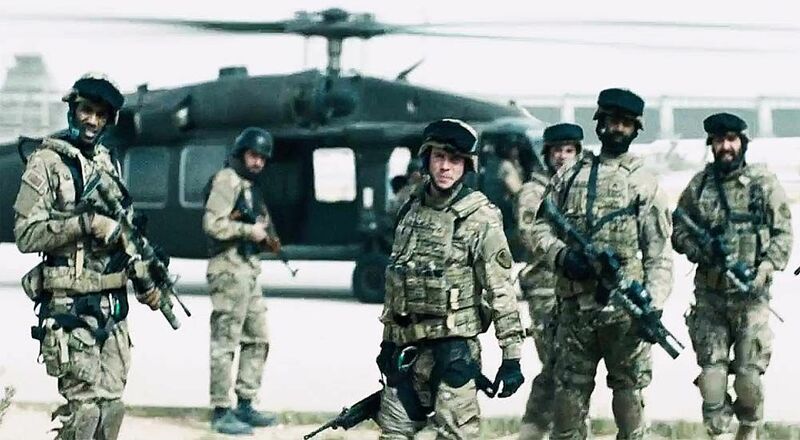 Monsters: Dark Continent is neither of those things. It's a bad film, an unfortunate sequel to a piece of independent cinema that is fascinating and worthy of your attention. Gareth Edwards has moved on to much bigger things, having since helmed the new Godzilla film and currently working on the first installment of the Star Wars Anthology series titled Rogue One, due out by next Christmas. I'm thrilled he parlayed his undeniable talent into both personal and box office success. I only wish they could have left Monsters alone, as perhaps his name garnering further attention would have had more viewers seeking out what got him started. Now a terrific little film has been forever tied to a turd.